Oleg Pokhanovski began his career as a violinist at the age of 6, giving his first performance with the Kuybyshev Symphony in Russia. At 10, he was accepted into renowned Special Music School for Gifted Children in Moscow and later studied at the Moscow State Conservatory. 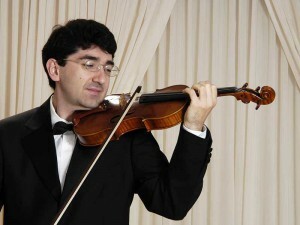 Pokhanovski cites his most influential teachers to be his uncle violinist Lev Zaides, and pianist Svetlana Vorobyova. Invited to move to the United States, he received full scholarships at The Juilliard School and the Manhattan School of Music studying with Dorothy DeLay, Pinchas Zukerman and Ani Kavafian, and took part in the “Solisti dal Mondo” program under Taras Gabora. Oleg Pokhanovski is a top prizewinner of eight prestigious international violin competitions including the Paganini in Genova, Sarasate in Pamplona and CIEM in Geneva among others, and was First Prize Winner of the 1990 Scheveningen International Violin Competition. He is also a twice recipient of the prestigious Canada Council National Career Development Grant, as well as a multiple recipient of Conceil des Arts du Quebec and Manitoba Arts Council Grants. Pokhanovski has performed in the U.S., Canada, Europe, Israel and Russia, giving over 2000 concerts in total. He has been presented in the Carnegie Recital Hall, the Grand Hall in Moscow, the Concertgebouw, Knight Hall in Prague, Place des Arts in Montréal and others. His solo appearances with orchestra included the Moscow Philharmonic, Moscow Virtuosi, The Hague Symphony, Toronto Symphony, Montréal Symphony and Winnipeg Symphony orchestras. His concerts brought rave reviews claiming him “Russian Paganini” and describing his playing as “brilliant”, “phenomenal”, “outstanding”, and “extraordinary”. He has also been invited to perform on national television and radio in Russia, Serbia, Poland, Canada and the Netherlands. Mr. Pokhanovski is active as a chamber musician and has appeared in the International Virtuosi Series in Germany, International Music Academy in Kiev, Ukraine, Domaine Forget in Quebec, Centara New Music, Agassiz Summer Chamber Music, Orford and Pender Harbour Music festivals in Canada. He is a Founder and Artistic Director of the “Oleg and Friends” concert series in Winnipeg. Pokhanovski is also a very accomplished pianist. He has been performing both violin and piano concertos with symphony orchestras in the same concert, as well as playing very challenging works on both instruments in his recitals in Canada, US and Europe. Dr. Pokhanovski is also in much demand as a pedagogue and presently holds the position of Professor of Violin at the University of Manitoba, having previously held the same position at the Lake State Superior University in Michigan. He can be heard on three released CDs, entitled Solo Violin, The Mirror Image, and La Valse. Pokhanovski’s deep admiration for the great musicians of the past, Heifetz, Hofmann, Rubinstein, Milstein, Kreisler and others is evident in his sensitive, passionate style of playing.